Tunable white LED lighting fixtures enable adjustment of color temperature and intensity. The advancement of LED lighting technology and the proliferation of cost effective LEDs have brought the capability of tunable white lighting into the mainstream of lighting design, and to a much broader customer audience, but this new capability also adds complexity to existing lighting systems, and to lighting designs. Lutron tunable white control solutions are uniquely positioned to help achieve your design vision. For over 55 years we've been dedicated to providing the right lighting experience for every space, and we continue to expand our expertise and leadership in lighting control, with a demonstrated commitment to evolving technologies like tunable white LED control. Lutron offers a wide variety of services and support to ensure your selected lighting control solution meets your specification, facilitates the defined sequence of operations, and delivers value to your customers. Our goal is an excellent user experience throughout the project process and for the life of your project. With tunable white projects, fixtures and lighting controls must be chosen at the same time to ensure compatibility and performance. The two must be able to work together to achieve a successful solution. Lutron can help you select and install the right product solution for any project. There are several types of tunable white fixtures. 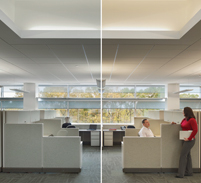 Through extensive research and development, Lutron has determined that to achieve desired results, it is critical to design around a fixture that enables separate control of intensity and color temperature. The only way to achieve precise control over color temperature is with a digital protocol like Lutron EcoSystem.